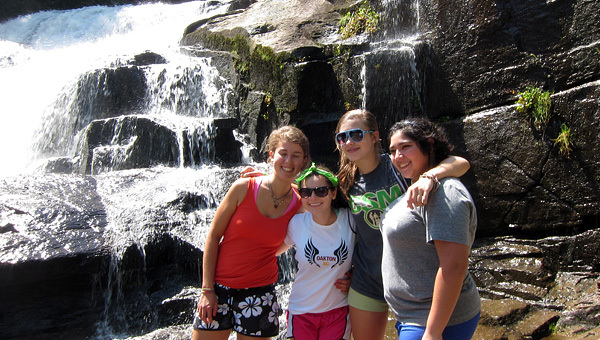 Wilderness and outdoor adventure sports are a big part of Rockbrook Camp! The girls attending camp can enjoy adventure trips like hiking, camping, overnight backpacking, whitewater kayaking, rafting, canoeing, high ropes course and rock climbing. 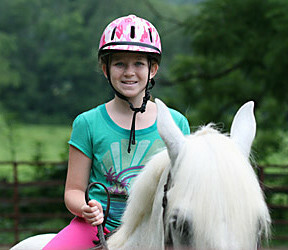 All of these outdoor activities are part of our adventure summer camps. 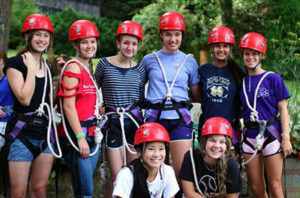 Rockbrook girls can really get outside and enjoy some true high adventure thrills! Last week, there was an open spot on a zip lining trip, and, since I have the greatest job in the world, I filled it. It was the first time I had been on our new, expanded zip line course, complete with three zip lines, one tight rope, and two rope bridges. I am not ashamed a bit to admit that my heart was beating double-time the whole time I was up there. I asked her what she was feeling, and she listed out sweaty palms, dry mouth, beating heart—in short, she described fear. Here she was, far from home, standing high on a mountain, and she was feeling, for the first time in her life, fear. 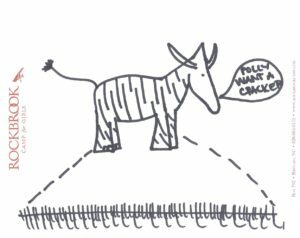 Now, she knew of course that she was wearing a harness, a helmet, and that she was hooked onto each line by two different tethers. She knew, intellectually, that she was safe. But that doesn’t stop the body’s natural reaction to the contemplation of jumping off a high rock face. But still, despite her fear, she jumped. Most of our campers, thank goodness, lead relatively safe lives. They can go through whole days, weeks, and months without feeling the rush of adrenaline that comes along with fear, and this is certainly not a bad thing. Still, in our modern, comfortable world, it can be easy to forget the immense benefits of fear. Let me clarify that by fear, I don’t mean the spine-tingling fear associated with horror movies or true danger. I mean that moment of breathlessness felt at the base of the Alpine Tower, looking up. 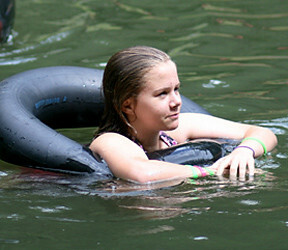 I mean the bottom dropping out of your stomach when you’re about to go down the Nantahala Falls in a raft. I mean the way a heart can clench in nervousness when you’re stepping out of the car on Opening Day. I mean the way a tongue can tie itself up in knots when meeting new friends. I mean the true discomfort of being utterly outside of your comfort zone. Here at camp, we live outside of the comfort zone. We brush our teeth in sinks shaped like troughs, we live in cabins with screens instead of windows, we try new things each and every day that seem crazy and terrifying. We push ourselves, in a safe environment, to challenge ourselves, grow, and find new limits to our bravery. And yes, this can be scary. It can be terrifying. But it can also be a transformative experience. That fear can precede the moment in which a girl decides that she wants to spend the rest of her life paddling, rock climbing, or even just putting herself out there and trying new things. That fear can precede a moment of true growth. My zip lining buddy grew that day. I knew it the moment she flung herself off onto the final zip line—the longest and fastest zip line. I heard her scream out in joy, and saw her smiling hugely as she went zooming away. She met me on the other side (after my own breathless ride), with her cheeks flushed, and her smile undiminished. 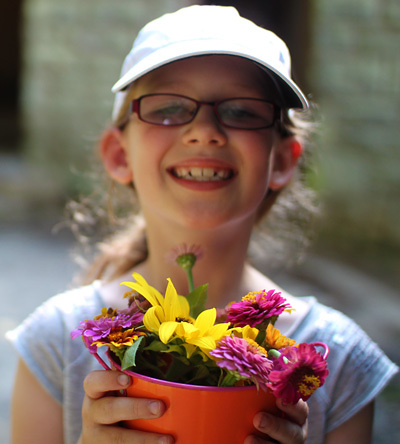 One of the best epiphanies that happens at camp is when a young girl discovers her creative side, when she realizes that she can be artistic, imaginative and make wonderful things. 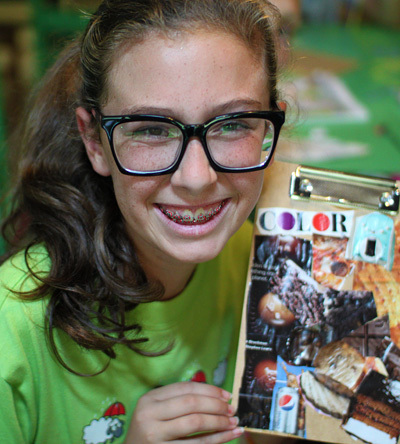 Camp provides daily encouragement and opportunities to experiment with arts and crafts, to be bold and expressive using all kinds of physical media. At Rockbrook this means working with soft clay, yarns and fibers, threads, paint and ink, dyes, cloth, leather, wood and beads. Lately, the arts instructors have presented some pretty cool projects giving everyone something new to try. 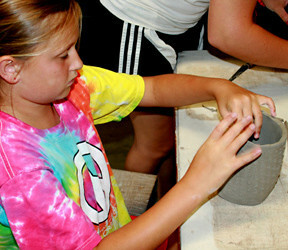 Girls are rolling out slabs of clay and pressing patterns made from scraps of lace. They’re sewing buttons and pieces of yarn to make sock puppets. 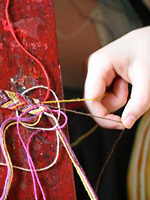 With baskets of colorful thread, they’re learning about weft and warp, knit and pearl, back and half stitches. Blending melted crayons and thick black ink on paper, they’re creating bold multimedia designs. There’s incredible satisfaction here because your girls are seeing real results from their creative efforts. It’s showing them that amazing things can happen, far beyond what they might first expect, if they step out and trust their creative abilities. What a great lesson for later in life, no matter what their eventual calling! Today has also been filled with outdoor adventure trips, with girls and their instructors hiking, kayaking and climbing nearby forests, rivers and rocks. The Hi-Ups (16 year-olds) took a “Hunger Games Hike” into the Dupont State Forest to visit a couple of sites where scenes from the recent movie were filmed. We scrambled up and over rocks to get the best view of Triple Falls, snapping pictures all the way. Feeling the cool spray at the bottom of a 100-foot waterfall while standing in bright warm sunshine is quite a feeling! A group of kayakers spent the morning, and another the afternoon, paddling the French Broad River with superstar instructors Andria and Leland. They chose a great introductory section to practice ferrying (crossing the current from one side of the river to the other) and catching eddies (pulling into calm sections of the river, downstream from obstacles), both important whitewater kayaking skills. Reports back at camp were all positive and brimming with excitement. Two groups of Middlers, meanwhile, spent the morning or afternoon activity periods rock climbing up on Castle Rock. There are six routes available up there and today the girls hopped on the two named “Shazam” and “Wham,” two of the more challenging options, each requiring both face and crack climbing techniques, as well as some real strength in steep spots. But boy can these girls climb! They may have slowed down to figure out a complex series of moves, maybe tried a tricky section more than once, but for the most part the girls scampered right up the 75-foot climbs. At the top, a fantastic view of the French Broad River valley is the reward, as well as the satisfaction of surmounting the challenges of the climb. When climbing, it can take real grit and concentration to forget how high up you are, and real muscle and balance to reach each handhold. These girls have got it all, and it shows! 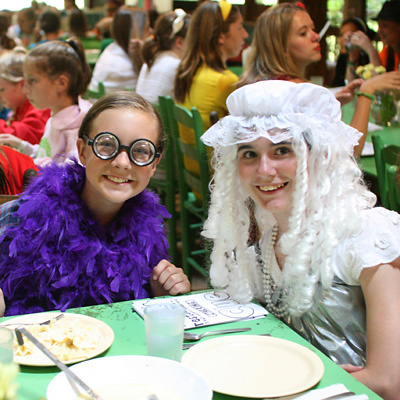 Tonight we had a Disney-themed dinner where posters and other decorations transformed the dining hall and the campers and counselors dressed up like Disney characters (loosely interpreted- camp versions). Here too, creativity fueled the enthusiasm for dressing up. Using face paint, borrowed items of clothing, goofy hairstyles, and a few accessories, like “Mickey Ears,” we ate with various super heroes, princesses, a mermaid, a chipmunk, a chef, and a few bears. 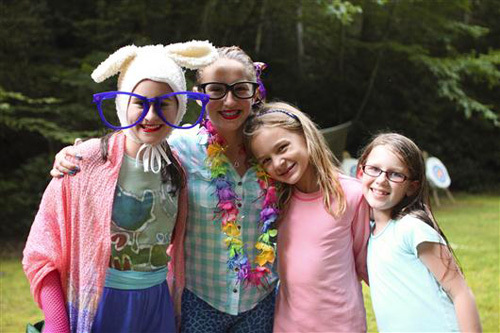 These Rockbrook girls love to dress up- “just for the fun of it.” They love the feeling of being silly, laughing their heads off with each other, posing and singing as loud as they can. It’s just their wonderful exuberance coming out in creative colorful ways. If you surveyed the 214 acres of land that make up Rockbrook, it would become clear why it is so aptly named. You’d see two large brooks (Dunn’s Creek and Rockbrook Creek) and two very large rock faces (Dunn’s Rock and Castle Rock). Here’s our camp map showing these features, and a cool aerial view that provides a sense of how the core part of Rockbrook is tucked in the valley between Dunn’s Rock and Castle Rock with creeks and streams carving crooked lines and channels downhill. These rocks high above camp have, over millennia, left many huge boulders scattered below. All over camp, there are examples, with some as large as houses, and many providing interesting features for camp life. There literally are rocks everywhere- prominent, named boulders like “Hiker’s Rock” and “Crack Rock,” rock steps, stone buildings, and surprising outcroppings in the forest. Just walking around Rockbrook means a lot of climbing and balancing. 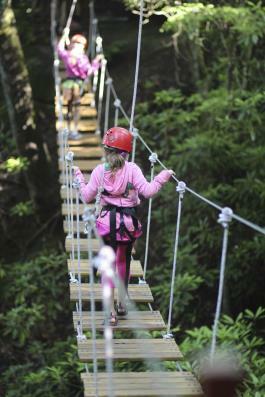 This setting has proven ideal for engineering a new adventure activity this summer: a 450-foot-long zip line. 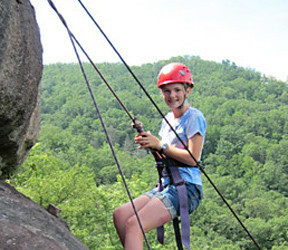 While most zip lines are built in trees or require the construction of a tall artificial tower of some kind, the steep terrain and rock outcroppings at Rockbrook provide a superior solution. We found the perfect rock up in the woods behind the dining hall that serves as the launching pad for a zip line. Accessing it however would have been difficult (there’s a steep gully to cross), so we built a fun swinging bridge from yet another boulder over to the launching rock. The girls gear up with helmets and a special dual-wheeled pulley tethered by a strong rope to their climbing harness, and then hike up the trail a short distance to step out on the swinging bridge. Suspended high above the gully, the bridge requires the girls to step carefully because we intentionally build gaps into the walking planks… more fun that way! 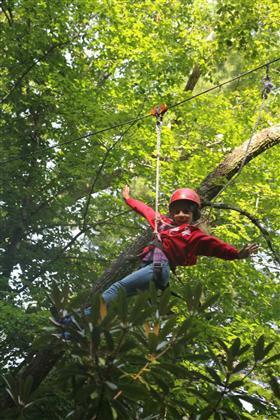 The zip line itself is a heart-pumping ride all the way across the camp to a sloping platform where the rider comes to a gentle stop and a staff member can assist her unclipping. 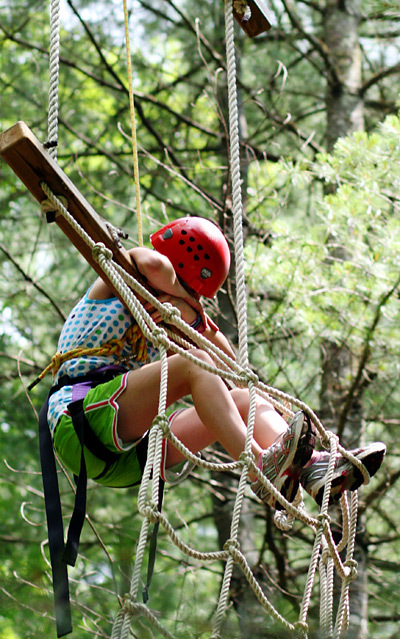 Every girl in camp, even the littlest juniors, will have a chance to experience the thrilling rush of the zip line this session. Another thrill popular with the girls this session is something we built last year, our 150-foot water slide, affectionately known as “Big Samantha” (it was unofficially named by a cabin of girls last summer). You can see from this photo that riders careen down a wet vinyl tarp material draped over two parallel cables, and fly out the end into the lake. Holding your nose is almost a necessity because you splash into the water surprisingly fast. Then it’s a short swim over to the exit ladders and back around the dock on the far end of the lake for another ride. 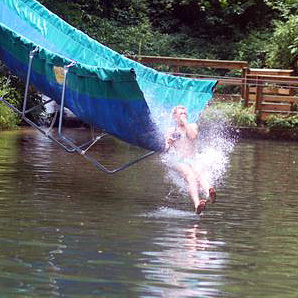 Here too, every girl who passes her swim demonstration can enjoy riding the water slide twice a day. The last stop for the evening was our favorite ice cream stand located at the entrance to the Forest, Dolly’s Dairy Bar. This is a chance for all the girls and their counselors to have a cup or cone of their favorite flavor, like the always popular “Rockbrook Chocolate Illusion.” You might think that eating ice cream after swimming in cold (“refreshing”) mountain water would be a far fetched idea, but with it being this yummy, and this much fun with all your friends around, it’s double scoop good! The pace of life at camp is an odd, though special, rhythm of big busy fun and unscripted time for exploring, relaxing and being with friends. 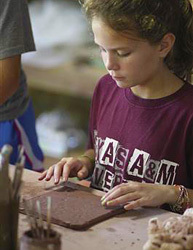 In addition to almost 30 different regularly scheduled activities, there are also 3 hour-long blocks of free time each day when campers can do what they like. 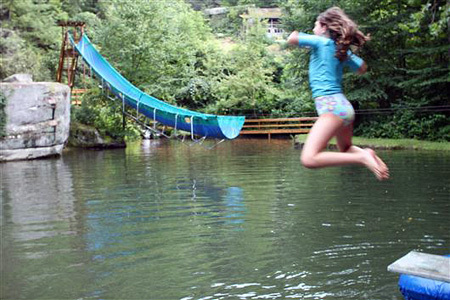 During these free times, the choice is theirs- swimming in the lake or playing in the creek, maybe staying active by joining the RBC walking club, playing a game of tennis, or jumping off the diving board over and over again. Maybe something quieter would be right, like chilling in a red porch rocker, reading in the shade of the big walnut tree on the hill, or finding a friend to hang out with to enjoy the view from “frog mouth rock.” And how wonderful this more meandering pace is! It has welcome therapeutic benefits for everyone compared to the hectic lives most of us lead the rest of the year. 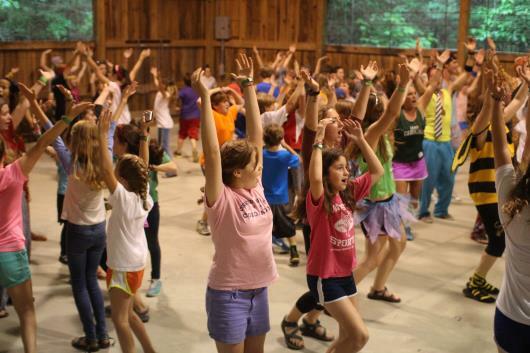 We often say it, but camp is a true haven. It’s a place where kids can be kids, where they can meet wonderful people and do amazing things, but also have plenty of time to be themselves and discover surprising inspiration in the world around them. 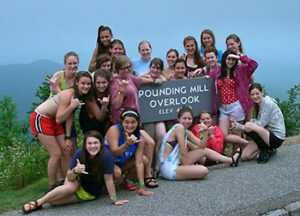 Six buses of girls took whitewater rafting trips on the Nantahala river today. Half of the group went over the night before to camp at our outpost property adjoining the national forest. 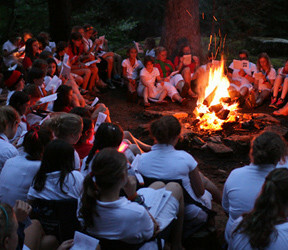 This gives these overnight girls a chance to sing around the campfire, roast marshmallows for s’mores and mildly frightening each other listening to the night sounds of the woods. Oh, the protection a flashlight can provide! The next morning, our team of raft guides were ready at the river’s put in with the Rockbrook rafting gear, and after hearing Andrea’s safety talk addressing, among other things, what to do if you fall out of the raft, the girls were soon paddling through rapids, shrieking with every crashing wave. 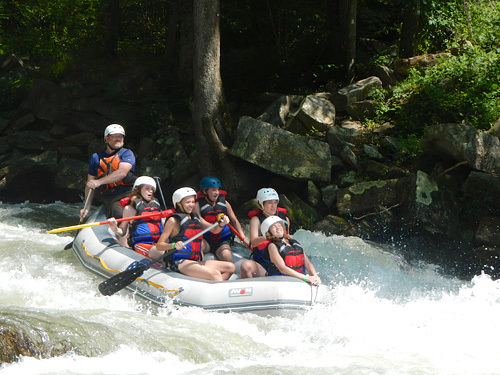 The entire trip down the river lasts about 2 hours and ends with a thrilling drop over the Nantahala Falls, a class III rapid also known as “Lesser Wesser.” After lunch, the second group of rafters enjoyed just as perfect a day of sunny and warm weather. Jubilant rafting adventure for these Rockbrook girls! Back at camp, the girls chowed down on a fantastic dinner of Caesar salads, topped with grilled chicken, and homemade Focaccia bread on the side. It takes the baker all day to make the bread, starting with just flour, water, olive oil, yeast and a little sugar. After rising a couple of times, spreading the dough into pans and baking it just right, we gobbled up almost every single piece. After dinner we announced that tonight’s evening program would be a magic and comedy show presented by Mr. Bill Grimsley down in the Rockbrook gym, and that everyone should come dressed in their best “magical” attire. 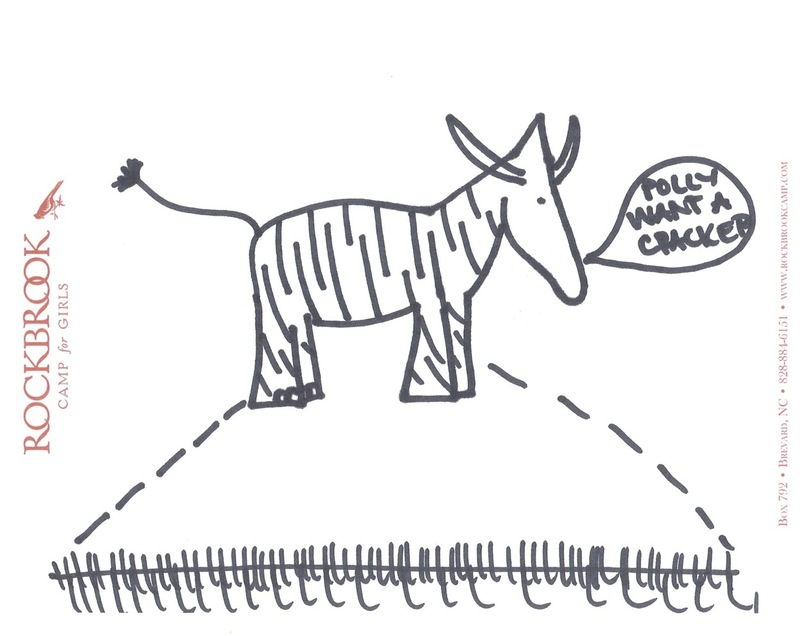 We’ll do that around here: dress up in a silly costume, just for the fun of it. 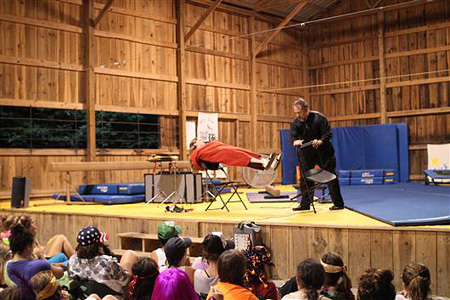 Bill’s a veteran performer having worked professionally as a magician since 1986. His show presents several classic stage magic tricks and sleight of hand illusions interspersed with funny comments (What’s a mummy’s favorite kind of music? Rap!) and audience participation. For example, tonight he used an electric jigsaw with a long metal blade to saw in half one camper and later levitated another on a plank suspended by a single folding chair. He made a white dove appear out of a ordinary balloon he blew up, and toward the end of the show made that same dove disappear from a box, with a live rabbit replacing it. He connected and disconnected seamless metals rings, performed several card tricks (making a randomly named card “flip over” in a deck) and rope tricks (cutting and restoring different lengths). It was a great show, full of surprises, funny and huge hit with the girls. P.S. Thanks for all the great comments and “Likes” on Facebook. Keep ’em coming, or feel free to comment at the bottom of these posts! Are You A Kayaking Girl? 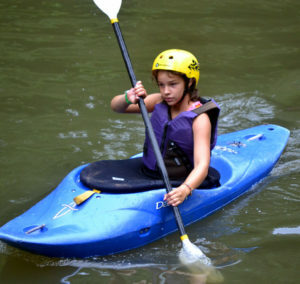 Are you a kayaking girl? Do you love fitting all the gear— helmet, PFD, skirt, and paddle —and squeezing into the boat? 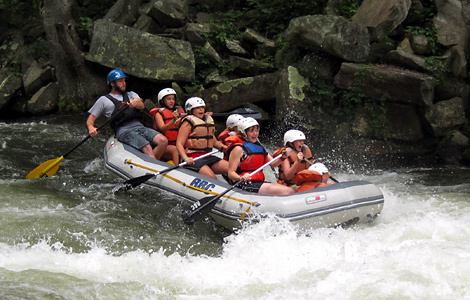 And the best of all, do you love getting out on the river and playing in the rapids? Catching eddies, surfing waves, and just playing on the water? 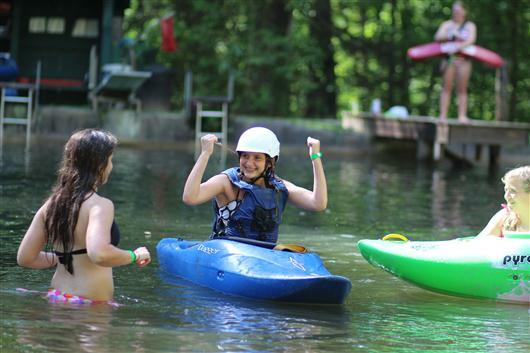 Maybe you do, or maybe you’ve always wanted to, but either way camp is the perfect place for kayaking. 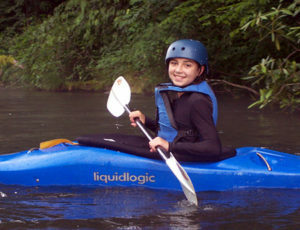 For example, just about every day down at the Rockbrook lake, girls enjoy kayaking classes. 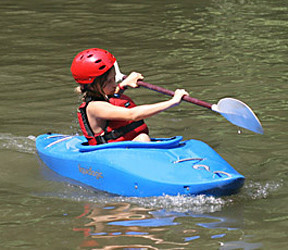 One of the camp whitewater staff members will be teaching basic paddling techniques, but also important skills like steering your boat, controlling your paddle, and learning what to do if you capsize your kayak. If you know all this, it’s still fun to get out on the lake and practice your stuff, and if you’ve never worked on your roll, then this is a great way to get started learning it. 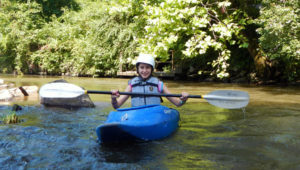 In addition to kayaking on our lake, Rockbrook girls are running the local whitewater rivers too! Every week we offer several day kayaking trips to the Green, Tuckaseegee, French Broad or Nantahala rivers. This is a chance to take the skills learned at the lake and put them to use on moving water, to learn more about reading the rivers (“downstream V !”), and honing your ferrying and eddying techniques. 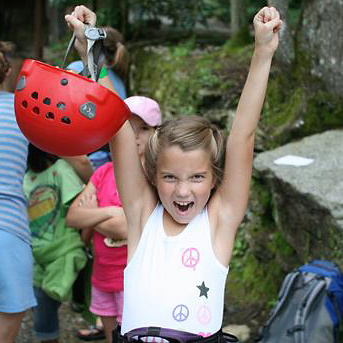 Around here, every kayak girl is having a blast! During one of the many tours of Rockbrook we’ve been giving lately, a parent asked an excellent question. “What do you look for when hiring counselors?” It’s really an important thing to ask, and it’s something we think about a lot, all year round, in fact. We know that our counselors are certainly role models for the campers, but also friends, teammates, sisters and moms to the girls as well. 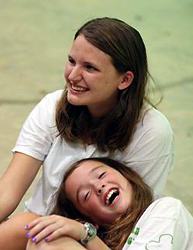 The first thing we look for in a counselor is simply an enthusiastic, energetic, friendly young (high school graduate or older) woman who loves children. The best counselors are naturally “kid people.” They have an innate ability to connect with children, to listen to them, and communicate with them authentically. 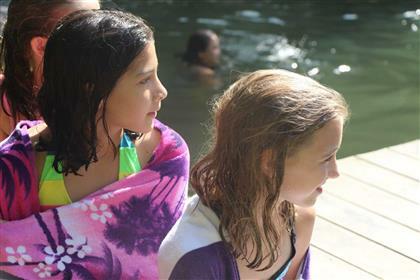 This allows them to become really good friends and to forge great trusting relationships with the campers. 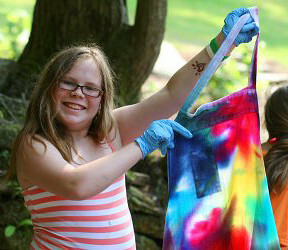 Of course, this makes camp fun and rewarding for everyone, camper and counselor alike. Even more specifically, another trait we look for in counselors, among many others, is a confident sense of adventure. This describes someone who isn’t scared to branch out and try new things, who is generally up beat and positive even when faced with the unknown or when something isn’t going exactly right (Raining? “No big deal! Let’s sing some rain songs…!”) Having a confident sense of adventure means being resilient, flexible, creative and improvisational. See how those are great qualities, and something that makes a wonderful role model for girls? There really is a lot of that going around at RBC. 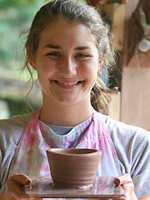 If you’ve ever tried to throw a pot on the wheel, you know that it’s not easy. It takes great patience to learn because there are so many ways a spinning ball of clay can crumple, wobble or even fly off the wheel. Everything can be going great, perfectly centered, and then suddenly your nice bowl collapses and it’s back to square one. 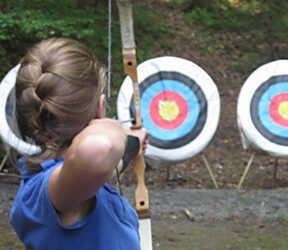 All of this makes it such a victory, a moment of pride, when a camper successfully throws something on the wheel, especially the first time. The Hi-Ups took an exciting trip into the Pisgah Forest this afternoon, stopping first at Looking Glass Falls. This is one of the most well-known waterfalls in this area, partly because it’s about 60-feet tall, but also because it’s easily seen from the main road. We came ready to swim, so after walking down to base, all of us swam through the pool and the spray just past where the water was crashing down. A few of the girls ventured closer to let some of the water smack them on the back, but it looked a little intense, if not painful, so there weren’t many takers. The cold mountain water and the roar of the falls was enough for most of us. Back in the buses, it was then just a short trip further to reach the Pounding Mill overlook on the Blue Ridge Parkway, one of our favorite stopping spots up there. It’s 4700 feet up (Rockbrook’s elevation is about 2350 ft) and provides a grand view of Looking Glass Rock below, a popular rock climbing destination. By the time we arrived it was getting near dinner time and there was a stop at Dolly’s in the plan as well, so today we came just for the view and a quick group picture. It’s always nice to get a little altitude! 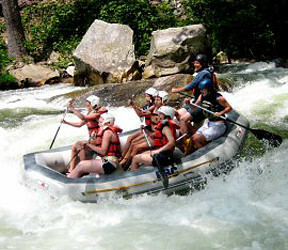 Today was the first of our rafting trips for the session, our big adventure out on the Nantahala river. We asked all of the middlers and seniors if they would like to go and came up with a huge list of excited girls. One option was to go over on Monday night and camp at our outpost. Rockbrook owns a 40-acre outpost camp located just past the Upper Nantahala Gorge in Macon County that is set up with simple cabins, a bath house, dining hall and campfire ring. It adjoins the National forest (about 2 miles from the Appalachian trail) and is only about 15 minutes away from the rafting launch site. We took 3 buses to the outpost to enjoy a nice dinner, time around the campfire with s’mores and songs, and a good night’s sleep out in the forest. The next morning we met our guides (Clyde, Sid, Billy, Sam, Andria and Leland) and launched the rafts for a perfect sunny trip down the river, complete with plenty of splashing and screams bubbling up on the rapids. A second group of campers met us for a picnic lunch before heading up to start their rafting trip in the afternoon. We had great weather on this trip as well, happily avoiding the thunderstorm that passed by to the north of us. These whitewater trips are loads of fun and for many girls a highlight of their outdoor experience at camp. By the way, Leland and Andria have written several books on whitewater boating, one on North Carolina rivers and another on some of the best whitewater in North America. Check them out over at Brushy Mountain Publishing. Good stuff. Meanwhile back at camp, we were rock climbing, really climbing. 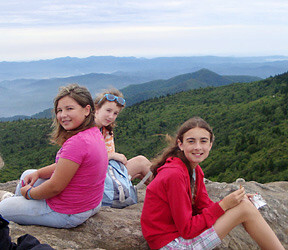 Our lead climbers, Maddie, Abby and Mallory organized several groups of Juniors and Middlers for a trip up to Castle Rock. 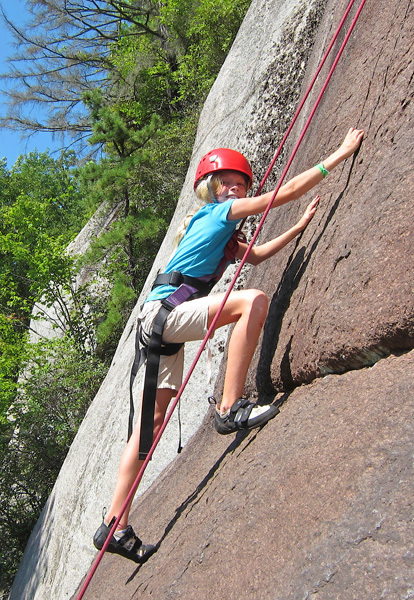 Some of the girls who signed up were brand new to climbing, so for them, just fitting the equipment— climbing shoes, harnesses, and helmets — was a part of the fun. But of course the real treat comes from making progress up the rock, from getting past a tough part, and often, from reaching the top and turning around to see the view. Even the littlest girls are great climbers. They’re so strong and agile, and generally fearless, they just zip right up the rock with very little hesitation. Dinner tonight was a surprise event for the girls. 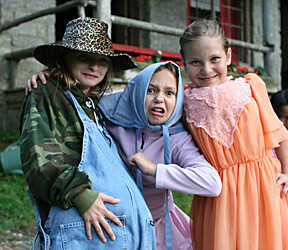 It started with costumes, as is usually the case at Rockbrook. This time we all turned ourselves into a giant game of Clue. Like the classic board game, versions of Mrs. White, Professor Plum, Mrs. Peacock, and Mr. Green could be seen eating dinner together. 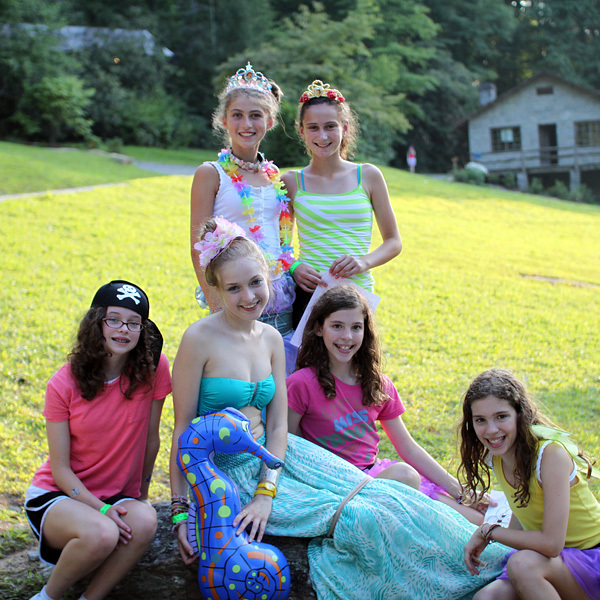 Afterwords, the girls broke into their cabin groups to play a camp-wide game of Clue where, like the board game’s mystery that’s solved by following clues discovered in different rooms, the groups ran around camp to find different clues. Each station, the group had to perform a task of some sort before receiving their next clue. Quick name all the RBC activities, or make up a song about trees, or stand in a human pyramid, and so forth. 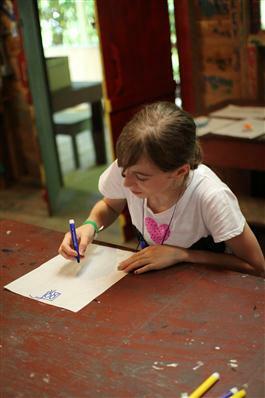 The clues led every cabin group to each of the different stations and finally to the solution— where Sofie was hiding. By the end, there were prizes for everyone, but it was Junior cabin 4 who ran the fastest and performed their tasks the quickest to win overall. Let’s queue up some adventure this summer at camp with whitewater kayaking! If you haven’t tried it, you are in for true high adventure… challenging thrills, the exciting surprises, and a solid dose of the power and beauty of nature. There’s some really cool kayaking gear to learn about and a first step of simply getting comfortable paddling the boat, but then campers spend time on the Rockbrook lake practicing basic techniques for kayaking, like what to do if you tip over (“wet exit” or even “roll”). Heading out to some of the local whitewater rivers is the next step. We have to master maneuvering through the river’s rapids… crossing fast-moving water (“ferrying”), stopping in a pocket of calm water (“catching an eddy”) and pulling out of an eddy (“peeling out”). 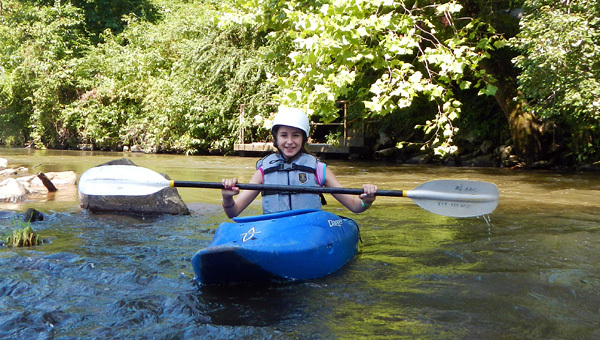 Girls love kayaking camps because there’s always something new to learn, a new river to paddle, and a new challenging rapid to conquer… perfect summer time adventure! Let’s go! 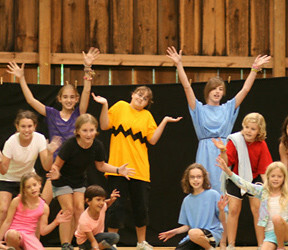 Camp is an adventure! It is because it gets girls outside for all kinds of exciting activities. Climb high up a real rock! Paddle a raft down through whitewater rapids. Sleep in the woods far from the “comforts of home.” These, and other outdoor activities, are just plain thrilling. The answer might be a little surprising, but it actually boils down to danger. It’s true; an adventure activity always carries a degree of risk. It’s an activity where we “take a risk in the hope of a favorable outcome” (as my dictionary puts it). So for example, rock climbing includes the risk of falling. Whitewater boating has the risk of capsizing, and when camping in the wilderness there’s always a chance of horrible weather (among other things!). But of course adventure isn’t about getting hurt or experiencing some disaster (there’s safety training and equipment to help with that). It’s about avoiding danger despite the threat of it. Adventure is about overcoming the difficulty and conquering the fear associated with an activity. Adventure activities are thrilling because we can actually do them despite the risk. Through our own efforts, applying specialized knowledge and skills, we succeed in the face of possible failure. Sure it might be a struggle, but it feels great. Yes, an adventure activity can be difficult, but also really exciting to face it and win! That’s why, incidentally, adventure activities are so good for boosting kids’ confidence. 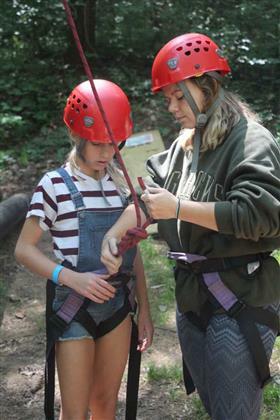 Being at Rockbrook provides so many great ways to be adventurous, opportunities to try activities that may look a little scary, but then with the right instruction, encouragement and role models, to also manage the risks and cope beautifully with the challenges involved. Very cool stuff!